Step aboard this traditional Maldivian Dhoni boat and cruise through the Maldives – known as the flower of the Indies. You'll be relaxed as you eat and sleep on board this cozy vessel. Dive into the crystal clear tropical waters as you swim and snorkel over the beautiful coral reefs. You'll sail between unspoilt palm fringed islands and visit local fishing villages. 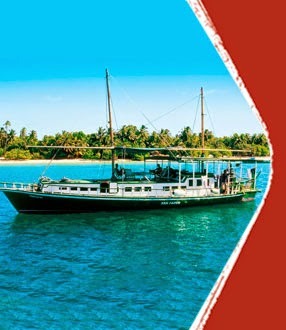 Enjoy beachside barbeques and traditional music and cultural performances on this 8 day Maldive Dhoni Cruise from $1,483* per person including 7 nights onboard a Dhoni, 7 breakfasts, lunches and dinners with an Explore representative on board, boat crew and cook to make this the perfect way to explore and relax in the Maldives. www.exploreworldwide.com.au Book now to explore these fantastic destinations. Explore Worldwide is a global small group brand offering unique adventures to some of the world's most fascinating locations. Group sizes range from 14 to 20 people.